David Tinker & Associates Ltd (DTA Ltd) provides support, including dissemination and networking, to innovative agricultural engineering in topics such as Precision Agriculture, Controlled Traffic Farming and efficiency of resources. 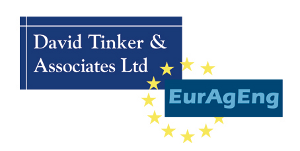 DTA Ltd manages the “European Society of Agricultural Engineers” (EurAgEng) and the associated “European Network for Advanced Engineering in Agriculture and Environment”, (ENGAGE) and David is the Secretary General of both. EurAgEng has over 2000 full members, drawn from 18 National Societies, providing a pan-European network of agricultural and biosystems engineers, covering research, development, commercial and advisory activities. ENGAGE is an informal network of research organisations from around Europe and both support EC proposals and project dissemination. EurAgEng has started a series of seminars at the SIMA and FIMA agricultural machinery exhibitions for dissemination and networking. These seminars support the successful annual “AgEng” series of conferences which attract 500-1100 attendees. Other information is available via the website, emailed “Updates” and the printed “Newsletter” and especially the EurAgEng official scientific journal, “Biosystems Engineering”. For Smart-AKIS, DTA/EurAgEng have teamed up with Agri-Tech East to provide Smart Farming Technology workshops in Eastern UK.